This package contains two 360ml bottles of AO Sept Plus HydraGlyde solution with long-lasting hydration. Each bottle of solution comes with a special contact lens case that contains the special AO Disc catalysing agent. 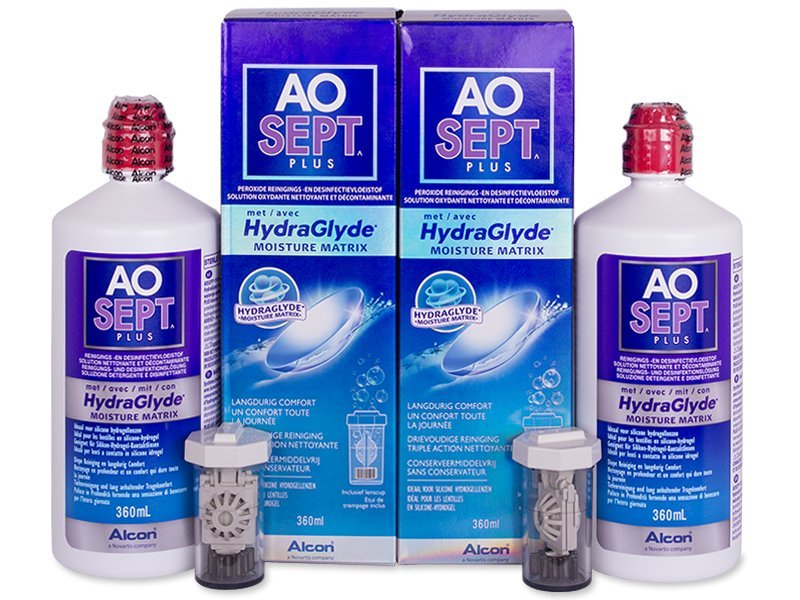 AO Sept Plus HydraGlyde® is a peroxide-based solution designed to disinfect all types of soft contact lenses. The moisturising agent HydraGlyde® provides lenses necessary moisture for the entire time they are in the eyes. This solution is packaged with a special case that contains the catalysing agent, AO DISC, which is necessary for the effective operation of the cleaning process. Package contains 2×360 ml bottles of solution and two special contact lens cases. 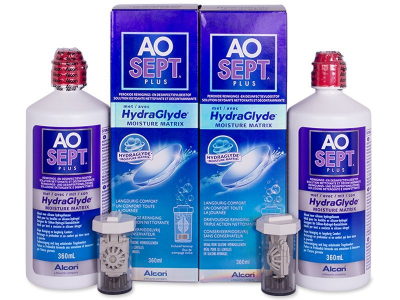 You can choose a smaller pack of AO SEPT PLUS HydraGlyde Solution. The moisturizing HydraGlyde® complex binds to the lens surface where it forms a layer preventing drying for up to 16 hours. Lenses are sufficiently moist and provide exceptional comfort. How does AO Sept Plus HydraGlyde® work? 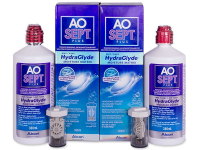 The active cleaning ingredient of AO Sept Plus HydraGlyde® contains 3% hydrogen peroxide. During the purification process, the lenses are completely disinfected as the hydrogen peroxide is neutralised, and the resulting solution is a gentle, preservative-free saline solution. Hydrogen peroxide has the character of a dilute acid, thereby effectively removing any deposits and undesirable microorganisms from the lenses. Direct contact of peroxide with the sensitive tissues of the eye could lead to burns, so it is critical to allow the lenses to neutralize in their case for at least six hours. The catalytic agent that is required to completely neutralize the solution is the AO Disc. This neutralizing disc is included in the special lens case, which is part of every solution package. Contact lenses must be stored in their special case, which should then be adequately filled with solution. The lenses should be stored like this for at least six hours to ensure complete neutralisation of the solution. The lenses may be stored in solution for up to two weeks, but after this time, the solution must be discarded and changed. The only solution that truely cleans my lenses - just do be sure to wait 5-6 hours to let it do its job. Can I buy an extra case for this solution separately?